Ascorbyl palmitate, otherwise known as vitamin C ester, is a form of vitamin C.
So, what’s the chemical difference between vitamin C and vitamin C ester? Vitamin C is a water-soluble vitamin, meaning your body eliminates excess amounts. This is good news and bad news: the good news is, it makes a vitamin C overdose very unlikely, because your body simply gets rid of any vitamin C you don’t need; the bad news is, this means vitamin C can lose its effectiveness very quickly.. Your body can’t make vitamin C, so you have to obtain it from food and supplements. Oranges probably immediately spring to mind when you think of foods rich in vitamin C, but it’s also found in other citrus fruits, broccoli, strawberries, bell peppers, pineapples, and more. Ascorbyl palmitate, however, isn’t found in foods; instead, it’s typically used as an ingredient. Vitamin C is one of the most powerful health-boosters out there and does more than just clear up your cold. Read on to find out how ascorbyl palmitate can keep you kickin’. Heart disease is the deadliest disease in the world—responsible for more deaths than any other ailment. (x) Many factors can lead to heart disease, including obesity, stress, and high blood pressure and cholesterol levels. Scientists believe this is due to vitamin C’s ability to lower cholesterol and triglycerides. A comprehensive analysis of 13 studies found that taking at least 500 mg of vitamin C daily significantly lowers “bad” (LDL) cholesterol levels and triglyceride levels. And because it’s an antioxidant, vitamin C can also protect your heart from oxidation, which can lead to inflammation and serious complications. In short? Your heart loves vitamin C.
Ascorbyl palmitate is the most bioavailable form of vitamin C, meaning our body absorbs it easily. This is good news for your skin–since you can apply ascorbyl palmitate topically, it’s easy to reap its antioxidant benefits, which keep your skin looking youthful and healthy. So how exactly does vitamin C work to protect our skin from the effects of aging? If you’ve ever gotten a nasty sunburn or noticed discoloration, dryness, and wrinkles after too much time in the sun, blame oxidation: free radicals activate when UV rays hit your skin and cause considerable damage to your cells. Sunscreen can protect you from free radicals, but not completely. Once again, it’s vitamin C to the rescue! When applied topically, this antioxidant shields your skin from UV oxidative damage: in studies, those who applied topical ascorbyl palmitate before going outside developed fewer wrinkles than those who had not (X). Vitamin C doesn’t just stop wrinkles in their tracks; it also reduces discoloration and keeps your skin firm and youthful. Ascorbyl palmitate helps stabilize the fibers in collagen, which keeps your skin plump, and it also slows collagen breakdown—a key cause of sagging, droopy skin. If you’re fighting wrinkles with little success and need a proven anti-aging supplement, try adding ascorbyl palmitate powder to your beauty cream. “Miracle worker” might be a strong word, but this antioxidant definitely comes close! When taken correctly, vitamin C ester is typically safe for use according to the FDA. (X) However, if you are pregnant, nursing, or have a chronic health condition (such as diabetes or kidney problems), you should speak with your doctor before using. Talk to your doctor before taking vitamin C ester if you’re on blood thinners, or if you’re taking any other prescribed medications. Vitamin C ester powder is the most popular ascorbyl palmitate supplement due to its versatility—you can mix it into beauty creams, topical salves, and beverages, and foods to act as a preservative. 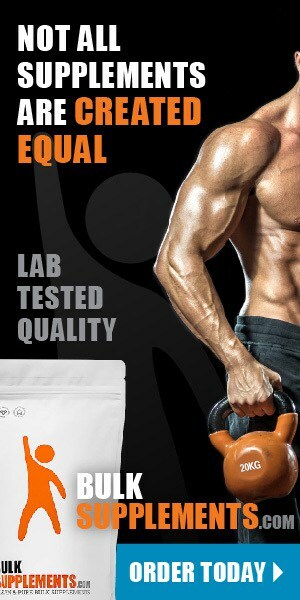 As a dietary supplement, take 500 mg (rounded 1/4 tsp) once or twice daily with food, or as directed by your physician. 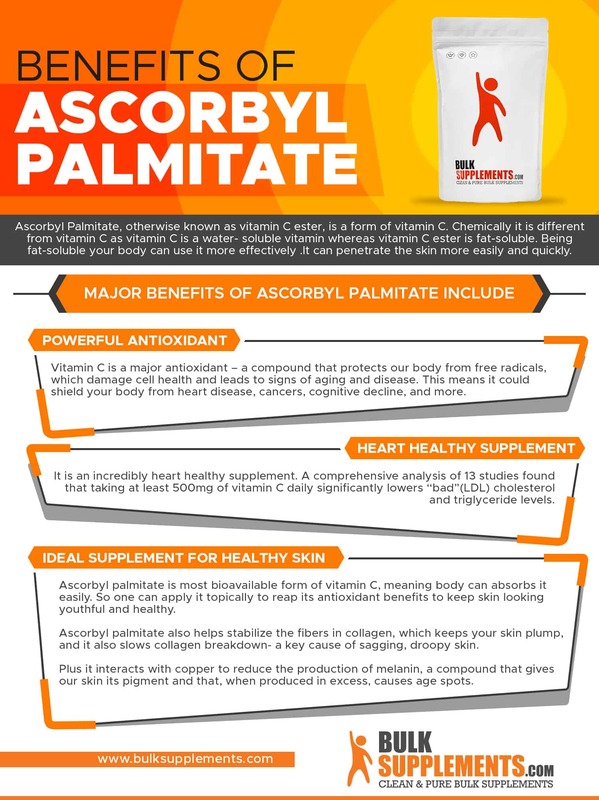 If powder isn’t your thing, you can always try ascorbyl palmitate capsules. Take 1 capsule (425 mg) daily with food for a health boost. An antioxidant powerhouse, vitamin C ester is a lifesaver for your skin, keeping it firm and youthful, protecting it from UV damage, and rejuvenating its overall appearance. It shields your heart from disease and inflammation by neutralizing dangerous free radicals. And, it’s safe to use.